Wellington community is sold out and is not in active development by builder. If you are interested in Wellington or similar new home communities, contact us today! Our agents are very familiar with new and newer construction in Toano, and can identify resale opportunities in Wellington, as well as builder inventory available in nearby or similar communities in Toano. To view more pictures, interactive maps and the full, detailed description of the Wellington community, please Login. Hire a custom home builder to construct that new home of your dreams in Wellington. This land offers a choice setting for home sites among the peaceful Virginia woodlands. 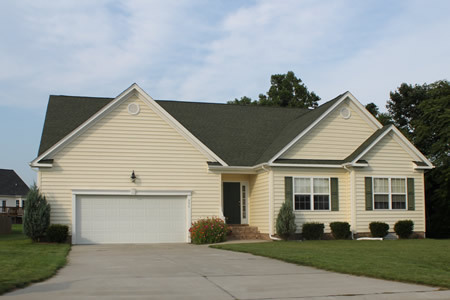 Conveniently located in Williamsburg, this development is easy for service members to use as a home base. They can get to military bases like Camp Peary, Naval Weapons Station Yorktown and Joint Base Langley-Eustis within minutes. Choosing a home site is one of the first big decisions homebuyers make before building a new home. Wellington has many lots to choose from and each one has its own unique features. An experienced custom home builder can work his magic on this land and soon, there will be an architectural delight. If choosing from one of the preexisting models, buyers will find each new home may include brick steps, foundation with crawl space, aluminum gutters, deck, ceramic tile flooring, Berber carpeting, direct vent gas fireplace, tray ceilings, custom cabinetry, Kenmore appliances, wood closet shelving, copper water lines, dual-zone heating system and more. A custom home builder can build the home but the homeowner builds his life. At Wellington, it is easy to do just that in these lush surroundings. Take a walk outside of that new home and into the fresh, country air. See the stars twinkle in the sky at night. Enjoy hearing your own thoughts again. A 14-acre lake and immense amounts of open, green spaces grace this land. Residents can party at the clubhouse and lounge at the pool. Williamsburg, VA, is not the typical tourist spot. While this region does attract people from all over the world, it is not exactly the same crowd that some may associate with more popular tourist destinations. This land of discovery offers refined entertainment for those who know learning can be fun. Museums, landmarks, shops, eateries, educational institutions and exhibits all make this area fun to visit but even better to live. Hampton Roads lookout- there’s a new community in town. Designed with the buyer and custom home builder in mind, this development redefines the good life. A new home in Wellington is a new direction; come see where it leads. Send me more information about communities similar to Wellington. Our agents gladly offer FREE property tours of Wellington, Toano and homebuyer consultations to all serious buyers. Our Toano SH Pro is prepared to represent you and your interests so you can move into your dream home.